Prepare for one of the coolest names you'll ever find in biology: Draco volans. This means flying dragon in Latin, and the gliding lizards of Southeast Asia are the happy recipient of such an august name. 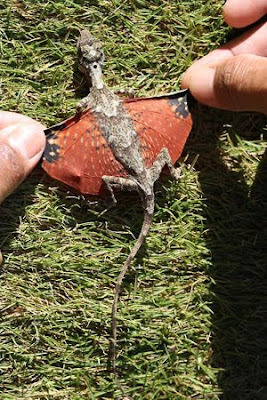 These lizards can't fly, but they come close. They come equipped with skin flaps attached to moveable ribs. These flaps are colorful, provide camouflage when closed, and allow them to glide from tree to tree (with the average male having a territory of one to three trees). Instead of ravaging castles and stealing away with the maiden fair, the Flying Dragon is the doom of ant and termite colonies. It's all about scale (pun intended). Look how small! LOVE IT (and the pun too)! what a cutie! wish he would come and decimate my fireants!